For the DJ Muggs vs. Ill Bill album, see Kill Devil Hills (album). For the musical groups, see The Kill Devil Hills and Kill Devil Hill (band). Location in Dare County and the state of North Carolina. Kill Devil Hills is a town in Dare County, North Carolina. The population was 6,683 at the 2010 census, up from 5,897 in 2000. It is the most populous settlement in both Dare County and on the Outer Banks of North Carolina. 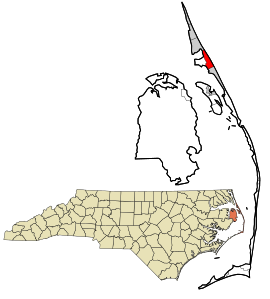 The Kill Devil Hills Micropolitan Statistical Area is part of the larger Virginia Beach-Norfolk, VA-NC Combined Statistical Area. The town is home to the site of the Wright brothers' first controlled, powered airplane flights on December 17, 1903, chosen for its good winds. The town was commemorated by the Wright Brothers National Memorial, which was dedicated in 1932. At the time of the flight, the town of Kill Devil Hills did not exist, and it did not receive its municipal charter until 1953. Kitty Hawk, popularly noted as the site of the famous flights, is approximately four miles (6 km) to the north, and was the nearest settlement at the time of the famous flight. Kill Devil Hills is the site of the Wright Brothers National Memorial, commemorating the siblings' four powered airplane flights of Thursday, December 17, 1903. Orville returned in 1911, and on October 25 he set a new world glider record, remaining in the air 10 minutes and 34 seconds, soaring against the wind with very little forward movement. In addition to the Wright Brothers National Memorial, Sam's Diner in the town is on the National Register of Historic Places, listed in 1999. Kill Devil Hills is located at 36°1′32″N 75°40′12″W﻿ / ﻿36.02556°N 75.67000°W﻿ / 36.02556; -75.67000 (36.025448, −75.670105), on the barrier islands known as the Outer Banks. According to the United States Census Bureau, the town has a total area of 5.5 square miles (14 km2), of which, 5.5 square miles (14 km2) of it is land and 0.04 square miles (0.10 km2) of it (0.36%) is water. As a result of its climate and proximity to beaches, the population rises significantly in Kill Devil Hills and other towns located on the Outer Banks during the summer months. As of the census of 2000, there were 5,897 people, 2,585 households, and 1,491 families residing in the town. The population density was 1,067.8 people per square mile (412.5/km²). There were 5,302 housing units at an average density of 960.1 per square mile (370.9/km²). The racial makeup of the town was 96.40% White, 0.61% African American, 0.17% Native American, 0.59% Asian, 0.12% Pacific Islander, 1.05% from other races, and 1.05% from two or more races. Hispanic or Latino of any race were 2.95% of the population. 26.4% had children under the age of 18 living with them, 44.2% were married couples living together, 9.6% had a female householder with no husband present, and 42.3% were non-families. 27.9% of all households were made up of individuals and 6.5% had someone living alone who was 65 years of age or older. The average household size was 2.28 and the average family size was 2.77. In the town, the population was spread out with 20.9% under the age of 18, 7.5% from 18 to 24, 38.1% from 25 to 44, 22.8% from 45 to 64, and 10.7% who were 65 years of age or older. The median age was 37 years. For every 100 females, there were 105.0 males. For every 100 females age 18 and over, there were 106.3 males. Kill Devil Hills is part of North Carolina's 3rd congressional district, represented by Republican Walt Jones, elected in 1994, until his death on February 10, 2019. His seat is currently vacant. Kill Devil Hills is home to the Outer Banks Daredevils of the Tidewater Summer League, a collegiate summer baseball league. The Daredevils play at First Flight Baseball Complex on Veterans Drive in Kill Devil Hills. The team, founded in 1997, began play in Kill Devils Hills in 2005. First Flight Airport (IATA: FFA, ICAO: KFFA, FAA LID: FFA) is a public use airport which is owned by the National Park Service and located one mile west of Kill Devil Hills. First Flight Airport covers an area of 40 acres at an elevation of 13 feet (4 m) above mean sea level. It has one runway — designated 2/20 — with an asphalt surface measuring 3,000 by 60 feet (914 by 18 m). For the 12-month period ending August 19, 2009, the airport had 38,120 aircraft operations, an average of 104 per day: 97% general aviation, 3% air taxi, and <1% military. The airport is notable for being the site of hundreds of pre-flight gliding experiments carried out by the Wright brothers. The U.S. Centennial of Flight Commission chose First Flight Airport as one of the stops for the National Air Tour 2003. First Flight Elementary School and First Flight Middle School are in Kill Devil Hills, just south of the Monument. Kill Devil Hills is also served by First Flight High School. The school first opened on Tuesday, August 17, 2004, to 800 students. Previously, high school students from Kill Devil Hills attended Manteo High School. The 2006 album "Black Hole/Blank Canvas" by Norwegian band Motorpsycho contains a track named "Kill Devil Hills". In March 2011, it was announced that bass guitarist Rex Brown (Pantera) and drummer Vinny Appice (Heaven & Hell, Black Sabbath, Dio) had formed a new band called Kill Devil Hill. The 2005 heavy metal album Tyranny of Souls by Iron Maiden frontman Bruce Dickinson features a track named "Kill Devil Hill". The song is about the flight made by the Wright brothers. In the 1996 R.E.M. song "So Fast, So Numb" from the album New Adventures in Hi-Fi, the lyrics mention Kill Devil Hills. The Clutch song "Four Lords (And One More)" from Slow Hole to China mentions Kill Devil Hills in its lyrics. Dennis Anderson, driver of the Grave Digger monster truck in the Monster Jam touring series, also makes his home in Kill Devil Hills along with most of the team's trucks. The Diane Chamberlain book 'Summers Child' is set in Kill Devil Hills. The 2005 song by The Coral "So Long Ago" from the Album "The Invisible Invasion", mentions Kill Devil Hills. ^ "Telegram from Orville Wright in Kitty Hawk, North Carolina, to His Father Announcing Four Successful Flights, December 17, 1903". World Digital Library. December 17, 1903. Retrieved July 21, 2013. ^ a b "Kill Devil Hills". Outer Banks Visitors Bureau. Retrieved April 5, 2013. ^ "Flying Machine: Construction and Operation – Chapter XXVII". Worldwideschool.org. 1911-07-01. Archived from the original on 2000-02-05. Retrieved 2009-10-25. ^ National Park Service (November 2, 2013). "National Register Information System – Sam's Diner (#99000062)". National Register of Historic Places. National Park Service. Retrieved July 7, 2018. ^ "Census of Population and Housing". U.S. Census Bureau. Archived from the original on May 12, 2015. Retrieved April 5, 2013. ^ Seelye, Katherine (February 13, 2019). "Walter B. Jones, 76, Dies; Republican Turned Against Iraq War". New York Times. Retrieved April 9, 2019. ^ "Daredevils History…". OBX Daredevils - A Collegiate Summer Baseball Team. Retrieved 11 April 2019. ^ a b FAA Airport Master Record for FFA (Form 5010 PDF). Federal Aviation Administration. Effective May 31, 2012. ^ "The National Park Service and the National Air Tour 2003 Announce Plans for Stop at Wright Brothers National Memorial". U.S. Centennial of Flight Commission. 2003. Archived from the original on 2006-09-23. Retrieved 2006-12-19. ^ Freeman, Darren (18 August 2004). "NO LINES, NO CROWDS, JUST MORE SPACE". The Virginian-Pilot. Retrieved 2009-10-25. ^ Metal Talk (March 5, 2011). "REX BROWN AND VINNIE APPICE FORM NEW BAND - KILL DEVIL HILL". Metal Talk. Retrieved October 11, 2017. ^ "So Long Ago - The Coral Lyrics - Google Search". www.google.co.uk. Retrieved 2018-03-23.